In the previous article, our dandong foundry has compared the cast iron and cast steel, herein, we will discuss cast steel versus ductile iron. Ductile iron chemical components include carbon content of 3.0% to 3.9%, but cast steel normally includes 0.08% to 0.60% carbon. So, ductile iron contains higher carbon content than cast steel. Cast steel and ductile iron do not have big difference with tensile strength, clients can choose different material grades to meet their application, however, ductile iron has highest yield strength of 40k psi, but cast steel only can reach 36k psi. 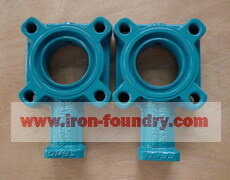 So, as for the equable grades, ductile cast iron has higher yield strength. Therefore, ductile iron can replace most of cast steel, moreover, sometimes can replace forged steel to be used to produce crank shafts and gears. Ductile iron has better abrasive resistance, corrosion resistance and inoxidizability properties than cast steel, so ductile iron castings have wide application in urban construction fields, and in the environments of water, saline water and steam. 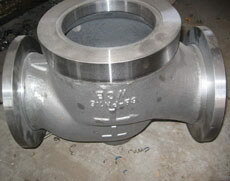 So, it is suitable for producing valve parts, moreover, ductile iron costs are much lower than stainless steel. Although ductile iron can reach elongation 18%, but cast steel can reach highest 25%. So, cast steel has higher elongation, and better impact property. Cast steel can reach AKV 30J. Cast steel has better welding character than ductile iron, so welding repair is commonly used in production, and it will not reduce the mechanical properties. But ductile iron has better shock absorption property, so it will be suitable material for producing machinery bases. Refer to iron-foundry.com. Although iron foundries could add some alloys into ductile iron, but alloy cast steel has more types and grades, therefore, alloy cast steel can meet various demand for special applications. As for normal sand casting processes, cast steel has similar production costs with ductile iron. As for special casting processes, ductile iron can be made by shell molding process, and cast steel can be produced by lost wax investment casting process, which will be more costly than shell molding method.